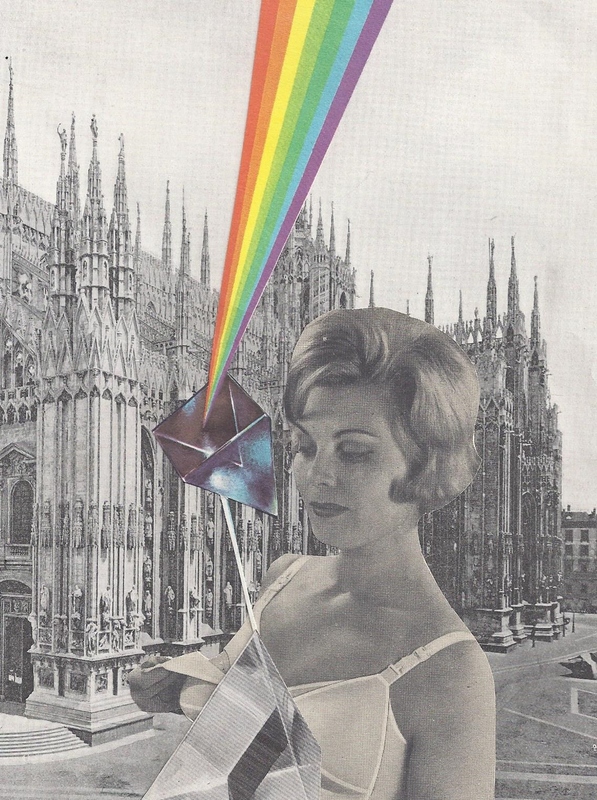 Original prototype version of collage used in the Holcombe Tarot Deck. Robert Holcombe is an entirely fictional British artist (b. Leeds 1923 – d. Exeter 2003) whose fascination with collage was first discovered when he began cutting up magazines and rearranging the parts whilst convalescing from injuries sustained in 1944, during active service in Malaya. He was a radio engineer, a contemporary of Richard Hamilton at the Slade School of Art between 1948 and 1951 and, from 1955 until 1988, a planning officer in the city of Leeds. His early, if oblique, involvement with the Independent Group continued into the 1980s, and he maintained a long correspondence with Eduardo Paolozzi, whose interest in elaborate fictions and alternate realities he shared. Although Holcombe did not exhibit publicly during his lifetime, he made most of his work under two pseudonyms – Gene and Michael Harrison. It’s also notable that many of his images, particularly those featuring material rooted in fashion, advertising and technology, show a more ambiguous enthusiasm for the world of the Post-War era than was generally usual at the time. His works are marked by a fascination with consumerist excesses, inscrutable apparitions of surgical, sexual and folkloric symbols inside modernist interiors, and unsettling disturbances of ordinary space. The Holcombe Tarot (1971 – 1975) explores ideas of meaning and randomness in a series of 78 collages that occasionally overlap traditional Tarot symbolism but mostly aim to remain ambiguous and open to multiple interpretations.